I am excited to hear this new D144! Would it be better than mustang king? In case you don’t know, Raub has the best private plantations as claimed by Stanley Ho who used to send his private jet to collect all the best mustang kings to be air flown to Macau. He shares his loot with Li Ka Shing annually. It was reported in the Star too. It tastes just like what I would expect a cross between the two to taste like, although there are other D2 x D24 hybrids which came out different. It’s not better or worse than Musang King, it’s just different. I think some D2 durians can be better than Musang King if you want a more fibrous durian. Yup, I’ve heard of his durian purchases, Pahang Musang Kings are older (40+ years) than Penang Musang Kings (20 years) so it tastes better. Wah, durians again! Syiok lah you.. Eh, by the way, when the durian season will be over ahh? I love cempedak, and I always buy fried cempedak if I see them at the roadside.. The smell, ooooo, heaven !! I now eat it almost every day. Haha! Yeah, durian season will soon be over but there will be another “shoulder” season which is shorter at the end of the year. Meanwhile, durian season in Sarawak and Sabah is just starting, read that durians were going for RM 0.70/kg in Kota Kinabalu! You can buy 100 kg for just RM 70 (price of a Musang King) or 1 ton for just RM 700! Fuiyo…bestnya. Visiting durian orchard some more. Please please come up in your blog with a list of durian orchard that is open for public visit . So far I only saw in FB groups organise visit to durian orchards of their relatives. Not much info on which durian orchards that is open for visit by public. Nice play with the phrase, a barrel of monkeys! Wow!!! 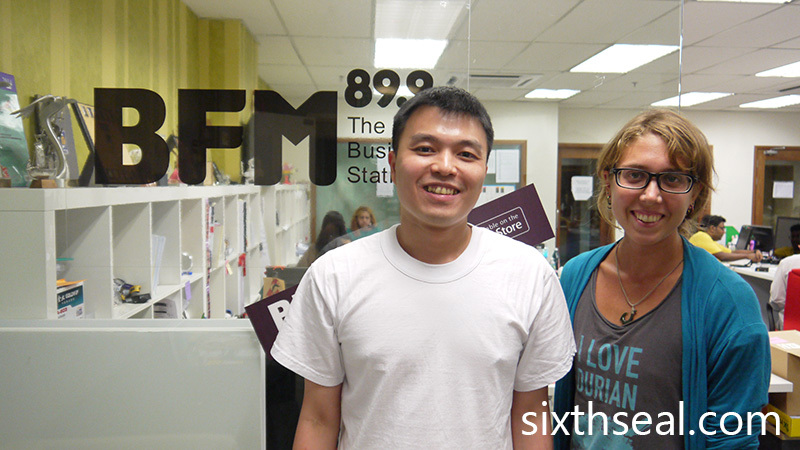 An ang moh who knows a lot about durians! Impressive! Many would not touch the fruit with a 10-foot pole. 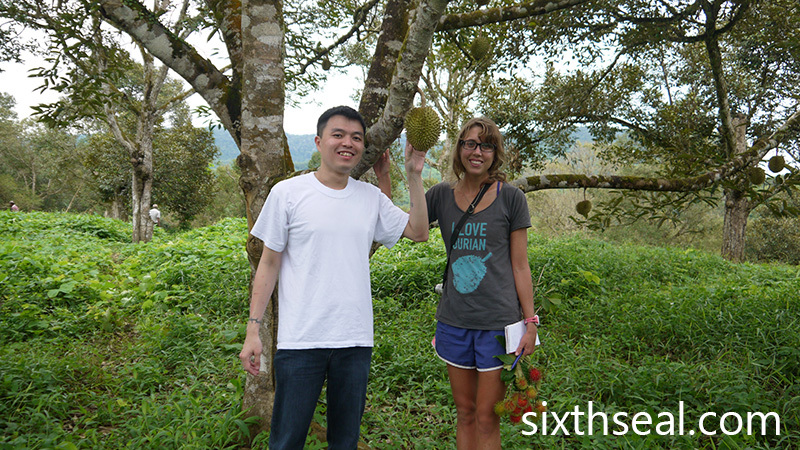 That’s why I like to pick her brain, she’s also eaten more types of durians than many locals. That’s dedication! I was quite impressed that she knows so much about fruits in general, it was a great learning experience, visiting orchards with Lindsay. great. the durian adventure. interesting haha. you will be durian master soon, no durian seller gonna dare cheat you by selling the cheap durians for a higher grade and price! I’m also apt to forget, so I think my speciality is already set, which is pharmaceuticals and substances with potential for abuse, for which I have a near encyclopaedic memory and experience to call from. Durian sellers will always attempt to cheat, at least the unsavory ones anyway, I avoid those shops and go to the honest ones. There’s one I highly recommend in SS6, nice people, generous too. A durian expert is a Caucasian! Great adventure with her. I would have thought it’ll be a researcher but she knows so much more than any University Pertanian researcher, for practical purposes anyway, and she’s travelled all around the region for durians. She even has a book about Thailand and their durians. Hi Huai Bin! Thanks for the great adventure :) I just got into LA last night – no durians here! The folks at Karak Durian Orchard wanted me to pass on that their farm is currently the only licensed organic durian farm in that region of Malaysia. The other one is no-spray but not licensed organic (SOM). The pleasure is all mine – it was a great learning experience and I really enjoyed eating all those durians and getting to know you. You know so much about durians it’s amazing. Cheers for the info! I’ll remember that. Yeah, I remember them saying they’re the only certified/licensed organic farm in that area.